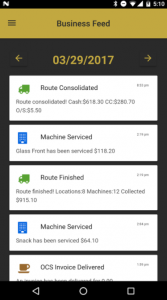 Parlevel’s Feed App helps you stay connected to your business by sending you everything you need to know about your vending, micro market, or OCS/pantry operation directly to your mobile phone. Receive push notifications for over 25 different activities like route progress, service ticket status, customer feedback, and more! Notification settings are totally customizable. Don’t want to be bothered by certain updates? No problem! You can choose exactly which notifications you want sent to your phone. Feed by Parlevel syncs up to Parlevel’s Vending Management System. Every time one of your team members marks a task as complete, you receive a notification on your phone. For example, when your warehouse personnel complete a prekit, a route driver services a machine, or an OCS invoice is delivered, you will know about it immediately. This information will help you know what is going on with your operation without the need to physically be there. 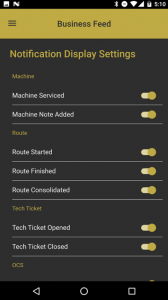 Feed helps you take care of important machine issues immediately. If a machine has an issue, like a coin jam, bill jam, or compressor problem, you will be notified as soon as it happens. Simply call up your technician or make a note for repair once you receive the update, and you can fix the machine as soon as possible. Now, you can make sure machine downtime is minimized which keeps you from missing out on missed sales or angering a customer. Inside the app, completed activities are displayed chronologically from newest to oldest. At the end of the day, you can scroll through the feed to see exactly what your operation accomplished on that day. You can rest easy knowing that your operation is humming, or take action if you notice something wrong. Want to learn how you can use the Feed app to stay connected with your business? Contact us here.